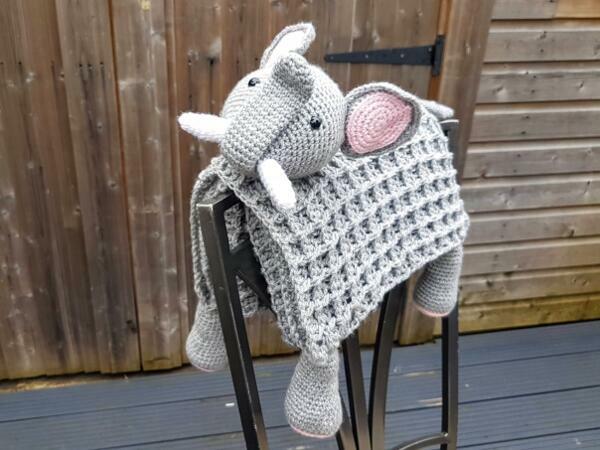 I started the safari series of the 3in1 baby blankets collection because my oldest grandchild would not model my hooded blankets unless i promised him I would make him and his baby sister matching elephant blankets. 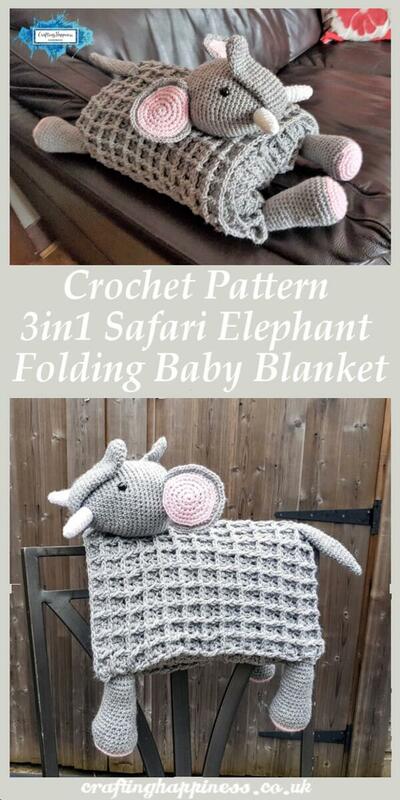 And this is how the 3in1 Safari Elephant Baby Blanket was born. 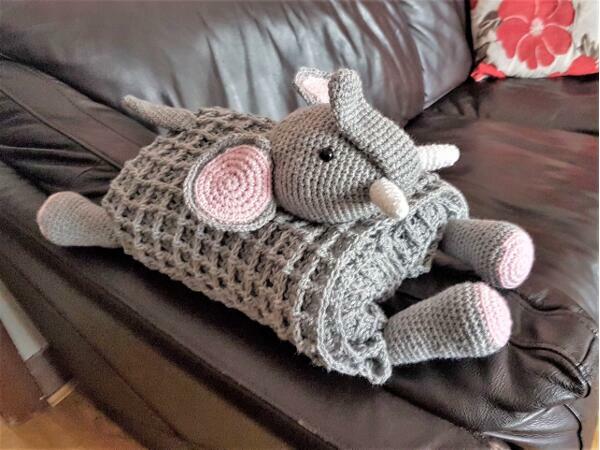 Just like my other 3 in 1 baby blankets, the Safari Elephant Baby Blanket acts as a toy, a blanket and a decoration for your loved one's room. 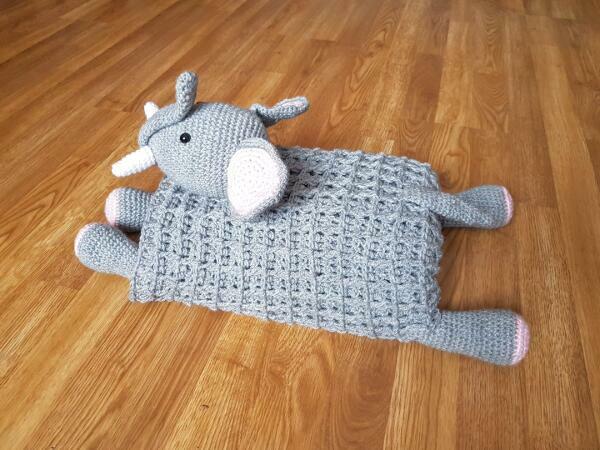 Unfold it and keep your child warm and snuggly while he is entertained playing with the elephant. Once done, fold it back and it instantly transforms into a decorative item that you can rest on the arm chair or the side of the cot. Made with double knit (light worsted) yarn, this blanket is warm and soft, but light in weight, perfect for babies of all sizes and ages. 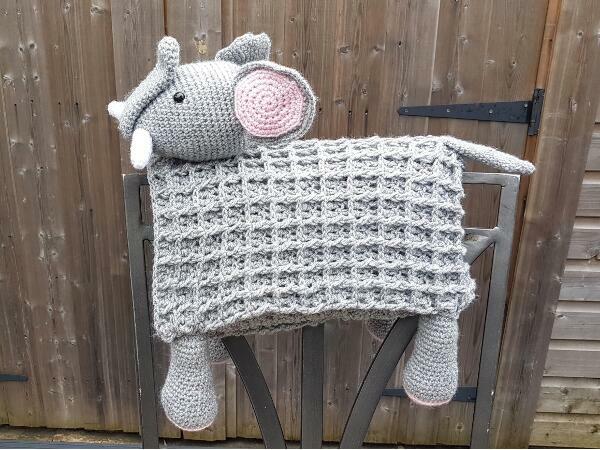 The blanket is crocheted in light grey color with light pink accents and will brighten any nursery, make it your own and choose any color that suits your color scheme and decor. Choose natural shades of white and grey for a neutral colored nursery or make it fun and playful with bright colors such as red, yellow, blue or purple. Your choice! This pattern will create a baby blanket size 100cm by 75cm (40in by 29.5in), but you can make yours as small or as large as you like by changing the number of the starting chains and the number of rows. 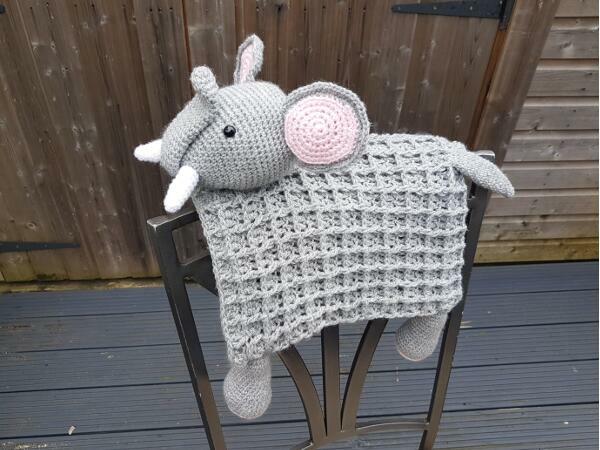 Looking for a different 3 in 1 baby blanket design? Before we continue, please note that this post contains affiliate links, I will earn a small percentage should you choose to purchase something, but it will be at no cost to you. You can read the disclosure policy here. 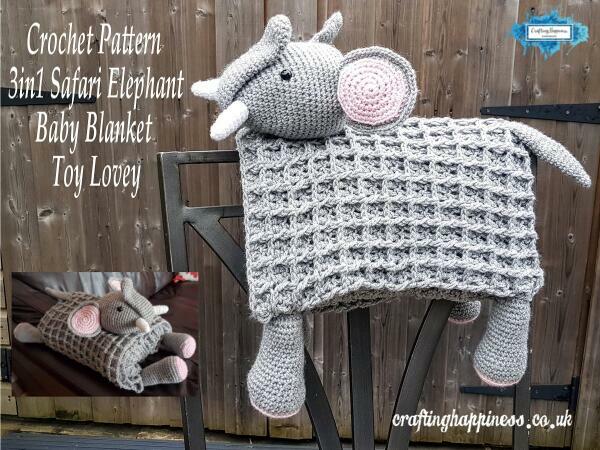 This pattern is available in my ETSY STORE and RAVELRY STORE only in a large print, inexpensive, printable PDF file, with lots of pictures and step by step tutorial on how to crochet yours. Unfortunately Marriner Yarns is only found in the UK, so for my international customers, I can recommend a similar yarn, Red Heart Yarn , which comes is a multitude of colours and weights, just as affordable and easy to work with as Marriner Yarns. I get most of my crochet supplies from Amazon, it's fast and easy and I find everything I need in one place. I also invested in Amazon Prime Membership which makes most of shipping free and deliveries super fast. Front Post Double Crochet (fpdc) – Yarn over (2 loops on hook), insert hook from front to back behind the double crochet post below, yarn over and pull up a long loop (3 loops on hook), yarn over and pull through 2 loops (2 loops on hook), yarn over and pull through the last remaining loops. First Double Crochet In The Row (dc1) – sc in the first stitch, ch2. Compared to the usual method of crocheting a double crochet in the first row (ch3), this method of constructing it will eliminate the gap that usually occurs between the first two stitches. Single Crochet Back Loop Only (sc blo) – A stitch has a front and back loop that meet at one end and look like an horizontal V (looks like this >). To single crochet in the back loop only, insert the hook in the middle of the V from top and under the back loop (the loop that is away from you), yo and draw up a loop. Yarn over and pull through the two loops. Decrease Back Loop Only (dec blo) – This is just like a regular decrease but made in the back loop of the stitch, just like the sc blo. Insert your hook under the back loop, yo and draw up a loop (two loops on hook), insert your hook under next stitch's back loop and draw up a loop (3 loops on hook), yo and pull through the 3 loops. Increase Front Loop Only (inc flo) – Like I said before, a stitch has a front and back loop. The front loop is the one closest to you. To increase in front loop only, insert your hook under the first loop, from front to back and draw up a loop, yo and pull through the 2 loops, insert your hook again under the same front loop of the stitch and draw up a loop (2 loops on hoop), yo and pull through the 2 loops (basically 2sc in the same front loop of the stitch). Single Crochet Front Loop Only (sc flo) – To single crochet in the front loop only, insert your hook from front to back under the front loop of the stitch, yo and draw up a loop, yo and pull through the 2 loops. Keep the tension relaxed, if your work is too tight, the ends will curl. Use one size up hook to make the foundation chain and first row. Using the yarn weight and hook size suggested in this pattern will create a blanket size 100cm by 75cm (39.5in by 29.5in). Gauge for the blanket for a 10cm by 10cm (3.9in by 3.9in) area is 4 rows by 13 stitches. 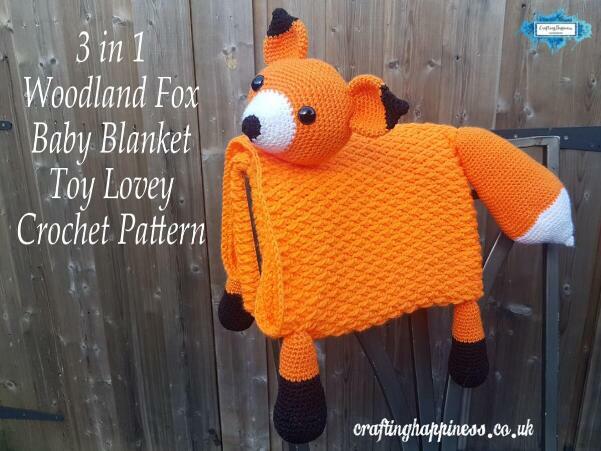 Grab your supplies and head over to my ETSY STORE and RAVELRY STORE for the large print, inexpensive PDF file with lots of pictures and step by step tutorial on how to crochet your own 3in1 woodland fox baby blanket. Hi there! 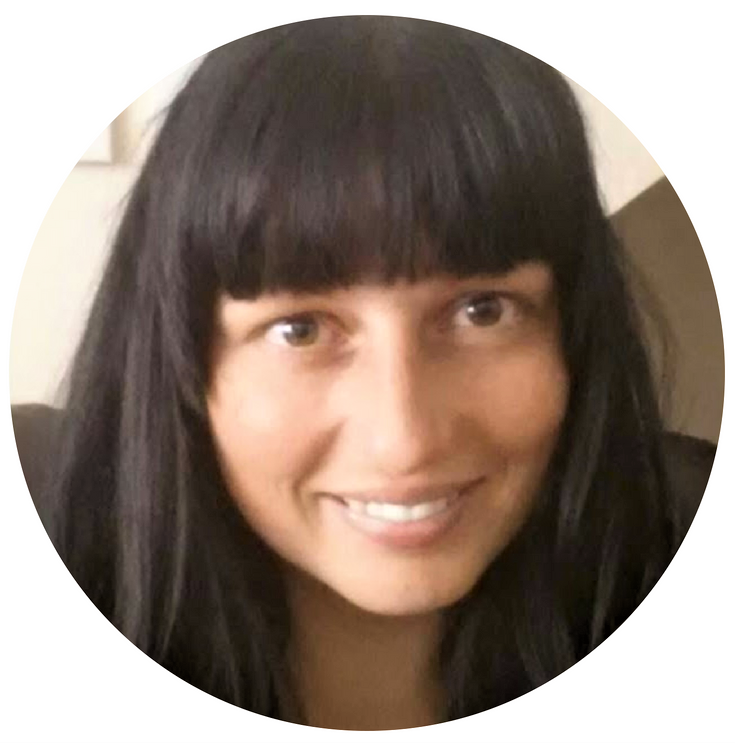 I'm Ariana, the crocheter and blogger behind Crafting Happiness. This is my place of creativity and happiness where I share my crochet projects and tutorials with you all. My patterns are free for the first 3 days from release so make sure to follow me on social media to be notified when patterns go live, you will find the links below. You may not sell my patterns and other projects or claim them as your own. You may make items to sell from my patterns and projects (i.e. on Etsy or at craft fairs etc. ), but I ask that you link back to my blog and provide credit for the pattern. 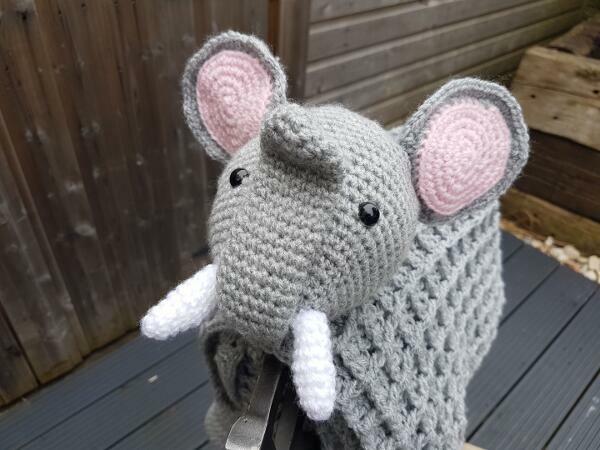 You are welcome to share my patterns and other projects on social media as long as you link back directly to my blog post (providing the link). No copy & paste of my patterns and projects will be allowed under any circumstances.